Home Schools / Boards ICSE ISC 2019 Exam Time Table for Class 12 – Released! ISC Time Table 2019 – Indian School Certificate (ISC) 12th Time Table 2019 has been released by Council for the Indian School Certificate Examination also known as CISCE. As per the schedule, ISC 2019 exams will commence from February 04, 2019. Students who will fill the form for appearing in ISC exam 2019 will be provided admit card from the school. Candidates have to appear in all the subjects opted by them. ISC 2019 Board Timetable for class 12th contains all the important information related to the exam. Candidates have to pass in all the appearing subjects individually in-order to obtain Pass Certificate. 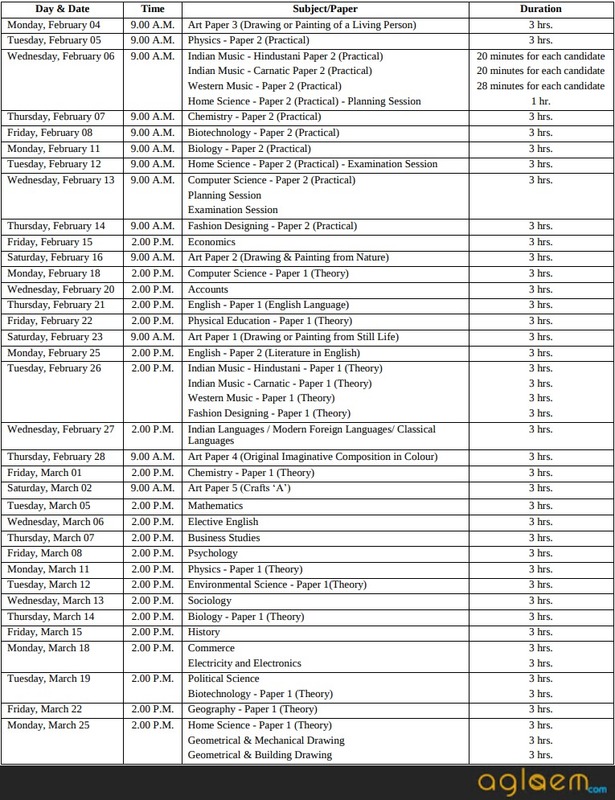 Latest: ISC 2019 Exam timetable has been released, scroll down to check the same. ISC has 543 centralized evaluation centres across the country. The total number of students who appeared for the exam in 2017 were nearly 74000 with passing percentage of 96.56%, which is pretty high. It is expected that numbers are going to rise this year. For the sake of the candidates, Students can check the dates of the examination 2019. Click here to download the ISC 2019 Exam Time Table for Class 12. You must mark all the dates on which your practical and theory exams are going to be conducted. As theory exam will be conducted in 2 shifts: morning and evening, make sure you know the shift in which your paper will be held. Time of morning shift is 9:00 am and for evening shift time is 2:00 pm. Make your timetable and set priority to the subjects as per the schedule of ISC Time Table 2019. Ensure that you reach for the practical exam before 9 o’clock in the morning to avoid any kind of hustle and bustle. Remember to carry practical file, stationery and other required things while appearing for the practical exam. Check all the details mentioned in ISC Exam 2019 Hall Ticket and locate the examination centre. This will help you in reaching the destination easily on the day of examination. You will be allowed to enter 30 minutes before the commencement of examination. After seats have been occupied by the candidates, you will be given question papers 15 minutes prior to starting of the exam. Read all the instructions on the answer sheet and question paper carefully. Go through all the questions in the paper and sort the ones that you will attempt first. This will save a lot of time during the examination time duration. Don’t be stressed out if you don’t know the answer of any of the question given in the paper. Stay calm and try to recapitulate what you have studied. Students appearing for ISC Exam 2019 have enough time to do preparation now. However, there is no need to get stressed out. Start revising what you have already completed. Make timetable, allotting the time to be given to each subject as per the ISC Time Table 2019. This will help you in getting hang of every subject that you are going to appear for. Note down key points of every topic as it will act as a quick go through guide during last week of preparation and while studying the day before the exam. Get previous years solved question papers and mark the frequently asked questions. This will give you an idea on the type of questions being asked in the exam. As many questions get repeated, chances are you make come across such questions. It will make it easier to score good marks in ISC Examination 2019. Preparing for exams is a good thing but being too focused only on preparation while ignoring your health is not going to work in your favour. Remember to take good sleep as a deprivation of sleep will affect your focus and concentration. Also, adopt good and healthy eating habits for strong mind and body.